Cops are often in frequent contact with homeless people. 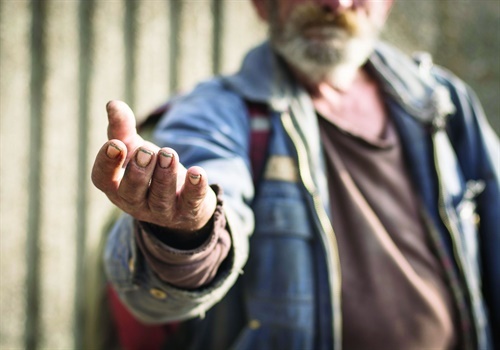 Homeless individuals can be victims of crime, witnesses, associates of suspects, or suspects. They can also be a useful source of information about life on the streets, but only if the patrol cops who come across them treat them like human beings. This is not to suggest all cops treat homeless people with contempt, but their interactions or concerns can range from, "I don't really care about them, as long as they aren't breaking the law" to "Get the hell off my beat!" to "I'll buy them a hamburger and a cup of coffee when I see them trying to stay warm on the corner." Some officers at larger agencies will volunteer to create or work in so-called HOT or Homeless Outreach Teams, which may consist of cops, social workers, mental health clinicians, and grant-funded or religious-based homeless advocacy specialists. The goals for these teams, of course, is to break the hardened cycle of homelessness, their accompanying untreated mental illness problems, and their interconnected harmful relationships with drugs and alcohol. Many of these team members engage in what homeless advocate Ryan Dowd calls "empathic problem-solving." His book offers his decades of insight and dozens of practical tools for the library folks, but his words also serve as an entrance into a world few cops understand, or may not even care about. As such, his book is useful for patrol officers as well. National estimates are that 20% to 25% of homeless people are mentally ill. Of those, 70% have personality or other psychiatric disorders: bi-polar, depression, paranoid, borderline, antisocial, schizoid, delusional, psychotic). Many struggle with autism disorders. Many cannot learn from their repeated mistakes and are constantly in conflict and rude with nearly everyone who tries to help them because they cannot control their interactions. About 40% of homeless people struggle with alcohol abuse and 25% with drug abuse. On any given day in the United States, 22% of the known homeless population are children, 40% are women, and 35% are families. None of this means that you should ever exchange your officer safety for your compassion when dealing with this population. But perhaps just having this knowledge as to the why and the how of homeless life can make your contacts with the homeless population easier on both sides.